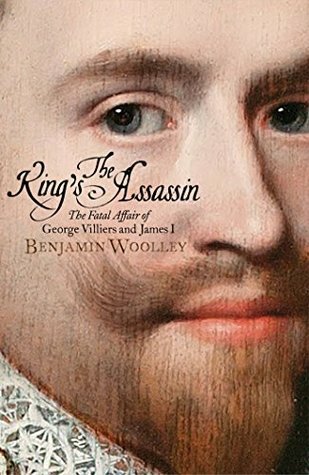 That’s him on the cover of Benjamin Woolley’s new book The King’s Assassin: The Secret Plot to Murder King James I: George Villiers, the Duke of Buckingham, painted by Michiel van Miereveld in 1625 when the subject was 32. In 1625 Buckingham was a worried man: that was the year when King James I died, and after ten years at the height of Court as the King’s favorite, the bulwark of Buckingham’s safety was disappearing. This was important for the obvious reason that although favorites are invulnerable while their patron is in power, that very invulnerability (and the arrogance it almost always encourages), they’re more vulnerable than anybody once that protection is gone. These young ganymedes were expected not just to serve wine, but to entertain and delight,” Woolley writes. “Success required an almost impossible alchemy of opposing elements: frailty combined with confidence, innocence with knowingness, masculinity with effeminacy. They had to be coy yet seductive, spontaneous yet calculating, lithe and quick, yet careful and watchful. Villiers took to that dangerous world like a lark to the open sky: Gentleman of the Bedchamber, Master of the Horse, Knight of the Garter, and, in 1623, Duke of Buckingham, the only duke in England. And for virtually the whole of that time, he and the King were inseparable. Buckingham was there during the King’s final illness and death in 1625, and although the king had for years been a gloomy hypochondriac with a growing list of genuine ailments, there’s been scholarly speculation for centuries that James was in fact murdered ... by his omnipresent favorite. As recently as 2015, Alastair Bellany and Thomas Cogswell produced their generously researched book The Murder of King James I.
intentionally, but parsing the difference between killing and murdering would probably be a bit unwieldy for a book title. There was nothing regal about James. The forty-eight-year-old was an unprepossessing, to some even slightly repulsive figure, of ‘middling stature’. He had a snub nose with pronounced bags beneath large eyes, like the awnings of a sail in a slack wind, giving him a doleful look. His red moustache and beard were ‘very thin’ and framed bulging, misshapen lips. As a cupbearer would be only too aware, his tongue was too large for his mouth, causing him to slobber and spill drink and food over his front. His complexion was ‘as soft as taffeta sarsnet’, the most delicate of fabrics, and he was rumoured never to wash his hands, only rubbing his finger ends slightly with the wet end of a napkin. He had a distracted air about him, his gaze roving around continuously, and was constantly fiddling with his codpiece. But he was good company: erudite, sensitive and clever, eager to be entertained and generous and sincere with his emotions and affections. This comes entirely from a 1651 screed traditionally attributed to a lying Court worm called Antony Weldon and has no reliable attestation elsewhere, and its appearance early on in the book is a worrisome foretaste of a storyteller’s subtle urge to smooth and flatten and polish. But then, books like The King’s Assassin have their fullest lives not as exhaustively counter-weighted history but as stimulating ‘what-if’ constructions: what if King James hadn’t died when he did? What if Buckingham had a hand in his death? Woolley takes the skimpy-to-nonexistent evidence in hand and does what can be done with it, but nothing in The King’s Assassin is likely to dent the insouciant semi-smile in that portrait.